Delio and Caitlin loved the idea of a veranda wedding at the DoubleTree Hotel at SeaWorld, in Orlando, Florida. Just a couple of months after the venue reopened from an extensive remodel, and Delio and Caitlin fell in love with the veranda lawn. With a outdoor fireplace to the right and lush tropical plantings everywhere, this place is like a tropical escape. Carly with Designer Weddings by Carly Rose did an amazing job pulling together all the details and vendors to make this wedding go off without a hitch. Sweet by Holly made the delicious cakes and cup cakes for the couples reception. At the end of the evening there was not a morsel to be found anywhere. Cliff from CRB Entertainment provided the DJ services for both the ceremony and the reception. He kept the guests on the dance floor until the final song. Adam King Photography came up from South Florida to shoot the beautiful couple and their fun wedding party. Juan Carlos with RJ Glam provided the rentals and the gorgeous florals for the evening. The amazing bouquet for Caitlin was absolutely stunning to behold. 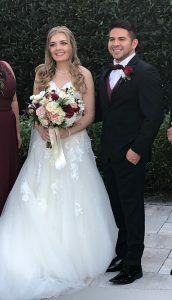 Congratulations Caitlin and Delio! We wish you happiness for a lifetime.